Over the past thirty years, I have been exhibiting large-scale sculpture throughout the United States. I have always been interested in sculpture and three dimensional forms. The Cycle is from a series of sculpture I have been creating for the past five years. This work represents the cycle of the seasons and the four elements (Earth, Water, Wind and Fire). The orange color represents warmth, heat and growth. This is a more universal meaning. The overall form represents a gate that has opened and is pivoting on the earth. The two forms are in opposition to each other and are placed to create a dynamic sculptural composition. If a goal is sought either consciously or unconsciously in the form of a work of art, one must solve innumerable problems and make innumerable decisions in order to achieve that end. One of many decisions I have made is maintaining and preserving the natural quality of the materials I work with. This sculpture was cut out of 11-gauge sheet steel then welded into its final form. The base is constructed of 1/4" steel plates with four anchors to hold it to the concrete pedestal and requires a crane to lift it into place. 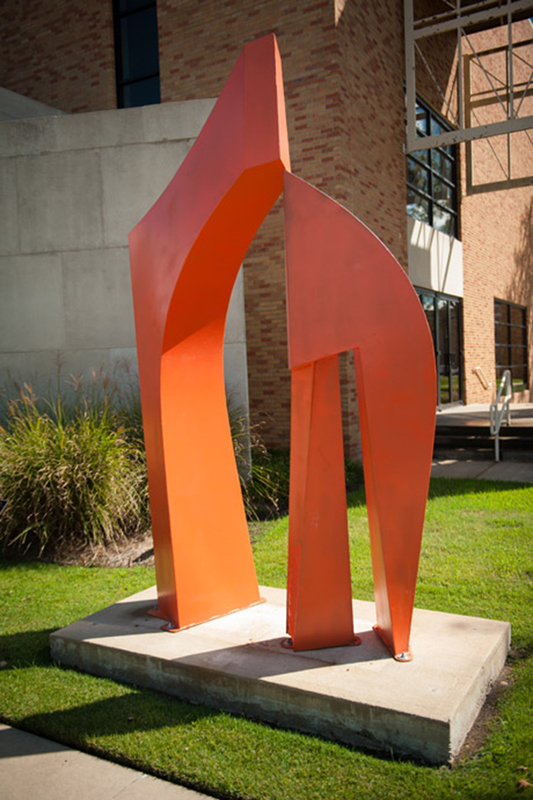 The placement at the Art Center identifies it as a unique piece for the students and faculty. Although this sculpture is painted specific colors, it changes depending on the time of day and season. It also changes as you move around the sculpture and its relation to the surrounding architecture and landscape. Between nature and the sculpture, I am condensing time and space. They are ever changing. My interest in exhibiting large outdoor sculpture is being part of the environment and landscape, so that the public can enjoy the work and see the changes throughout the season. These sculptures are from a series of work that deals with the concept of nature, the seasons and the four elements; Earth, Water, Fire and Wind in our universe on the micro and the macro level. It expresses the cycle of life, growth and continuum. The Cycle is from a series of sculpture I have been creating for the past five years. My interest in the four elements and nature gave me the opportunity to explore one of the most interesting forces; it is that moment of separation, escaping and attraction toward each other. Where the landscape moves all the time so that viewpoints constantly change, passages open and close, the relationship of those forms compliment the positive and negative space the sculpture contains. I am conscious of the impact these sculptures will carry. The viewer will regard the work a contribution to contemporary sculpture because of the visual weight and aesthetic qualities. My Goals: (1) To continue exhibiting and participating in symposiums and conferences on national and international level. (2) To make the public aware of the new exhibitions and to stimulate interest in public art and local schools. (3) The maintenance of high quality work and craftsmanship. (4) A commitment to national and local exhibitions. Providing lectures and workshops in academic and professional fields. (5) Promoting public art. (6) The continued development of my research and creative work. Symposiums. My most recent accomplishments have included the participation in the following places, Art in the City Plaza in Raleigh, Cary outdoor Sculpture, Kingsport Tennessee, Lakeland Florida and several more. Most recent symposiums: Hojer Denmark, Granby Canada, Breckenridge Colorado, St. Blasien Germany, Tultepec Mexico all of which were International woodcarving or welded steel symposiums. Unfortunately, sculpture doesn't pay all the bills, so I have a small construction business to help fund some of the larger sculptures and public art programs like this help fill in the blanks.